This script is an improved version of Cam Control that also incorporates a sliding camera effect to normal player movement. – Pan the camera to x, y coordinates. This script adds a scene where you can face two actors against each other in a mini-game duel that plays similar to a fighting game. You can do Player1 VS AI or Player1 VS Player2 (on same computer). The combat itself is fairly basic, you can move, jump, attack and block, using the actors’ stats and hp to determine damage. Each actor also has stamina that can prevent them from attacking when it gets too low. 4. Put this script below Materials and above main. This scripts allows you to equip pets to your actors that grant skills and abilities. These pets will appear alongside animated battlers (if you are using a compatible animated battlers script). A menu scene is also available to equip, feed and view your pets. Feeding a pet increases their level and also the bonuses they give to actors. The script uses Holder’s Mag series of battlers. This script is NOT plug and play or friendly for new users. It requires a lot of setup and understanding of rpgmaker database. 9. Keep in mind I spent ages writing detailed info on how to use this. Before you ask how something is done, please read over it! Paste this script below Yanfly’s scripts. – Display army name and some details about the army. 1. Place script under Materials and above Main (And under any battle scripts you are using). 2. Read script instructions and settings to learn how to use. 3. Make sure to start a new game after adding the script. This script can make the player only able to see in a certain radius around themself. The rest is darkness. This size and opacity of this darkness is controlled using variables and turned on/off using a switch. 2. Copy the image from the demo into your project’s /Graphics/System/ folder. 3. Read script instructions and settings to learn how to use and set variables. 4. Make sure to start a new game after adding the script. Allows you to use holder-style animated battlers in your battles. This is a simple implementation with not as many options as other popular animated battler scripts. Note tag actors and enemies to specify which battler spritesheets they use. Note tag your state, skills and items to specify which pose in the spritesheet they use. This script adds a fishing mini game with many options to customize each fishing experience. – Add specific fish or objects or randomize them for each fishing spot. Use eventing to add quest items. 1. Place script under Materials and above Main. 3. Read script instructions and settings to learn how to use. You’ll notice that the RTP doesn’t come with many useful fishing icons (to use for rods and baits), and there’s not a whole lot of fish for you to use included in the demo – you’ll need to source or make your own resources to use. This script replaces the default menu and thus will likely not be compatible with other scripts that do the same. 3. Read script instructions and settings to learn how to customize the menu to your liking (There’s a lot!). Just a simple script that allows you to specify regions with random encounters that are chosen from any previously defeated troop. A comment can be added to troops that you do not wish to appear in these past encounters (such as bosses perhaps). You can also call a random past encounter with a script call. This script adds a system of equipping shards to actors via a new scene. Each shard can give feature bonuses (just like equipping normal equips) and can also allow actors to use different skills depending on which shards are placed touching each other. It is NOT a plug and play script and requires a lot of setting up by you. Please read ALL the instrucitons and settings carefully if you want to try to use it. A simple shooter mini game that can be played within Ace with a script call. The game is designed to be simple. Enemies are random, they shoot random lazors at you. Powerups are random. Slowly during the course of the game the enemies spawn faster and faster until eventually the player will be overrun completely and die. A set time through the game, a reset powerup will spawn. If the player manages to get it, they get another chance at more points as it sets the spawn speed back to the start. Variables are used for current score and high score which you can use in your game to give your player bonuses for doing well or not. NOTE: This is intended to be simple for now. Please don’t ask for add-ons or improvements. I might improve it later but for now, it is what it is. Create image layers for maps that can scroll, move like the parallax or be stuck to the map. Created to be used for overlay mapping, fog or other image effects. There are other scripts available that do a similar thing, this is just my implementation of it. I recommend trying the others out (as they are possibly better!). I created this for myself but thought I’d add it to my archive for anyone to use if so desired. This script was written to fill some gaps in the move route commands. Chosen skills/items can display an indicator above the target during their animations. The outer part of the indicator shrinks down and if the player presses the designated button when it meets the inner part of the indicator – the skill can do enhanced damage/healing or apply/remove a state. This indicator can also be applied to actors and equipment to allow the player to defend against enemy attacks by applying/removing a state or decreasing the damage of the incoming attack. Each skill/item/equip/actor can use a different indicator graphic, be different speeds and have different difficulty of their timed presses. They can also do different state and damage modification. Vocab can also be set up to display different text in battle log when a timed hit is successful. A simple debugging script that displays information to the console (or a window popup for options you desire) such as what BGM/BGS/SE/ME just started playing, when a switch or self switch is turned on/off or what a variable was changed to. These notifications will only display during test play. Might be useful for trying to figure out why an event isn’t activating by viewing the console log of switches activated for example. Display a little “new” image next to items in your inventory that the player has recently acquired or has not looked at yet (a couple of options of ways for it to work). Just a little mini-script that I thought might be useful. Allows you to specify stat bonuses that equipment can give to the wearer on leveling up. This bonus is not lost if the equipment is removed. Just another pop up script (it’s been overdone, but I am still learning so doing it again). Manually create a text pop up or automatically whenever you give the player an item via event command – it pops up the item’s icon above their head with amount gained. A simple script that allows changing the leader’s equipped weapon on the map. Pressing buttons, you can cycle the actor’s equipment left or right through weapons in the inventory and display a pop message of which item was equipped. Allows you to set a respawn time for events that can activate a self switch or switch once their timer has expired. This time is kept from map to map. This could be used for things like planting seeds that will grow, enemy encounters that will respawn and more. Lower reflections (for uses like glass floor or water), shadows that are drawn from a light source location, mirror reflections (mirrors on walls) and displaying icons over characters. The reflections can use custom charset and be disabled for actors and events (vampires don’t have reflections and perhaps you can see if someone is good or evil in their reflections). 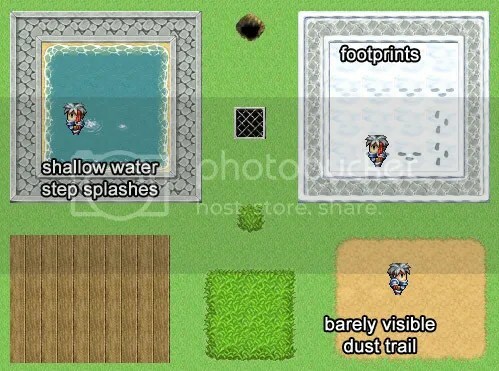 These reflections are drawn on the parallax – meaning it is not noob friendly, you will need some basic skills such as using a graphics program to make water tiles partially transparent or using parallax mapping. Adds an animated image above the player that can be turned on and off that changes depending on how close the next random encounter is (Like psone game “Legend of Dragoon”). Settings included to customise this image to your liking. Some extra options for the substitute feature, allowing you to specify states/actors/enemies that can only cover certain allies with the substitute feature. Can also specify states/actors/enemies that can not be covered. Added notetag to remove cover states after they successfully cover an ally. Works like the “Select Key Item” event command, except instead of key items it displays actor faces. Choose to either display only members in your party or to display a list of actors you specify in the script call. It outputs the actor ID to a variable for you to use eventing to determine what to do with it. – An image that can be used as a shopkeeper that can change throughout the shopping process (examples of using this is for smiling when you buy/sell item. Frowning when you don’t buy something, etc). – All the above can be changed with script calls to be different at each shop. – Use a variable to determine selling cost rate. – Rearranged shop windows and modified equip status window. – Added ability for each shop to keep it’s own stock. Selling items to shops will add those items to the buy list. This script allows you to bring up the “Use Key Item” box on the press of a button. When you select an item, it then activates the event directly in front of the player. Using EVENTING knowledge, you can set up conditional branches that contain ‘script’ condition to tell the event what to do when the item the player selected is used on that event. You can use the other categories (items, weapons, armors) by scrolling between them in the item window. ALL items are capable of being used unlike the regular use key item event command. This was designed for a more “adventure” style game. First things first. This script is purely cosmetic. It doesn’t control or look after whatever it is you are increasing/decreasing and using the bar to show. Eg. If you’re bar reaches full, YOU will need to set up using events what happens after it gets there. (See demo with an example of this). An exception is the variable bar (see below). The script can call a bar that will animate decreasing or increasing by certain amounts based on your input and then disappear again afterward. You can call a custom bar or a variable bar. The custom bar increases/decreases depending on the settings you give it. (It will not automatically adjust any parameters, experience, etc. for you. You do that manually). The variable bar will adjust the chosen variable automatically by the amount you set in the script call. These bars only work on the map. Use an image instead of the normal windowskin for message backgrounds. You can change this image any time during game. Put this script ABOVE my Message Busts script if you use both. Automatically show a bust instead of the face chosen in a “Show Message” window so you don’t have to keep using “Show Picture” every time. – Revert to normal messages with a switch. * usable but not fully-featured or customisable. This was an attempt at being able to show two messages at once. I couldn’t work out how to do it how I wanted and decided to give up. – you cannot skip through the text while displaying the double message (You have to wait for it to type out). – you have to add double message text with script calls which is painful and could be hard for beginners. Still, it works and may actually be useful, so I thought I’d upload what I’ve got here. Pretty simple. Press a button to jump. – Actors and equips can give bonuses to the jump distance. – Use regions to block jumping (so you can stop the player jumping over a wall inside a house for example). – Set a jump sound effect. A purely aesthetic change. Changes the “Show Choices” function to look like the screenshot in a visual novel style layout. – Use a custom graphic that is displayed behind each choice. – Also added text code to use to change the custom graphic for individual choices if desired. – Uses a graphic for the cursor. – Settings that allow you to tweak sizes and positions for using your own custom graphics for everything. Call a scene that allows you to assign each member of your party into different groups. These groups can have different headings, limitation on how many you can add and can also be locked or unlocked – all changeable via events during the game. You can call another scene that brings up just the list of groups you have made and select one to change your party to that group. Includes many script calls for use in events in an attempt to try and make it more flexible. (See demo for an example). – a home base, where the player arranges people in groups and you can use the number of in each group in variables to do different things with eventing. – a party system, perhaps the player’s party is group 1 and the rest are other members that you could swap into the party when the scene is called. – the party is forced to split up and go separate ways. The player can choose which members go which way in your story. This script allows the player to fly like superman with the press of a button (if a switch is on). – Doesn’t takeoff/land in the same spot like airship, can still move while descending/ascending. – Changes the player’s graphic and adds a shadow under him. – Set if you can activate events while flying or not. – If you set it so you can, you can use ‘script’ in conditional branches to check if flying or not. This script adds favour meters to battle. These favour meters increase by causing damage. When one side causes damage, it can also decrease the other side’s bar by an amount based on the gain amount. As the meter fills for each team (enemy or party) they gain a state that can be used to determine the benefits of having higher favour. Upon reaching max favour, a common event can be called to add any additional effects you might like. In addition to this, the team keeps their max favour for a set duration of turns, after which their favour is reduced to 0. Actors and equips can give bonuses to how much these bars increase. Enemies can also have different bonuses for this as well. Skills can also be set to modify either side’s favour bar without causing damage. Press a button to call a map scene that displays an image of the current map the player is on. (You create this image yourself). NOTE: This script does not generate the map for you. – script call to remove event display markers (quest finished). – make player require an item to view certain maps. The player can toggle the HUD on or off when needed. Works well with Tsukihime’s Rotate Formation script to switch the lead actor with the press of a button. Can customize windowskin and a few other options. This script was made to give more usability/functionality to nicknames. – Allows you to set bonus stats depending on the actor’s nickname. This could be used for a simple job, perk or race system. – Also has script calls to more easily use nicknames within your eventing. Notetag items and skills to play different SE when used from the menu. Notetag weapons and armor to play different SE when equipping them and set SE for clear and optimize commands. Any item or equip with no notetag will use the default SE as set in the database. This script allows the player to bring up a list of music to play. This can be added as a menu option or called via an event call. You can choose to add all files from a folder to this list or allow the player to collect music during the game by adding new songs with script calls in events. The player can now set vehicle bgm and battle bgm to a song that they have learned and change it any time they wish. Use a script call to return the battle bgm to the player’s choice after a boss fight changed it. Allows you to make any event a storage container and able to add or remove items from it with a script call. By default the containers are empty, but you can populate a container any time you choose with script calls. A bit of a warning, I have no idea the limitations of storing data and would be interested to know if any issues arose from storing hundreds of items across hundreds of event containers. A graphical selection option that can display when the player needs to make an emotional choice (by default: angry, sad, happy or none). Script calls can be used in conditional branches after this selection to determine what happens depending on the player’s choice. Every time a choice is made, a point is stored with the leader actor, to keep track of how many times that actor gets angry, sad, happy or is neutral. You can use script calls to use this data for other eventing purposes such as people responding to you differently if you are a more angry or a more happy person. Yes, this could easily be done with show choices and variables, but I thought someone might be interested to use a gimmick graphic menu and easier storing of response data. Messages do not stop the player from moving and will disappear if the player walks a certain distance away from where the message was activated (much like Chrono Trigger). – During the game, you can change the message-close distance by using a variable. – Can turn the no-wait feature on and off with a switch. I kind of gave up on this script as I failed at working out how to do things I wanted to. – While event commands after the message don’t wait for the message to finish, the demo includes evented ways around it. It may come in handy, so I thought I would post it anyway, but use at your own risk. – Pan the camera and then lock to x, y coordinates. NOTE: This script only works correctly with default screen size. An improved version has been written here. A scene that allows the player to store items and retrieve them later. Also now includes a bank to store gold. Includes a variety of script calls for eventing purposes. Includes options to customize the vocab of the scene as well as other options such as allowing the player to store key items or not. Replaces the default RPGMaker VX Ace menu layout with the one shown in the screenshot. You will need to supply your own portrait images, they are NOT included with the script. Leave blank to use the default vocab names (specified in the rpgmaker database). Any script that uses the vocab will likely not recognise the class param names (and therefore use the default instead). Combat messages and popups won’t use the class param names for buff/debuffs etc. The keypad is just a fancy version of the ‘Number Input’ event command. It outputs a number to a variable based on what was input. From then on, it’s up to your eventing skills what to do with the number. Set a variable for it to use and maximum numbers allowed to be input. Specify effects you want to happen on designated region tiles. I figure with access to these three things (and some eventing knowledge), you can create a region effect that does nearly anything you want so you don’t have to spam events everywhere.